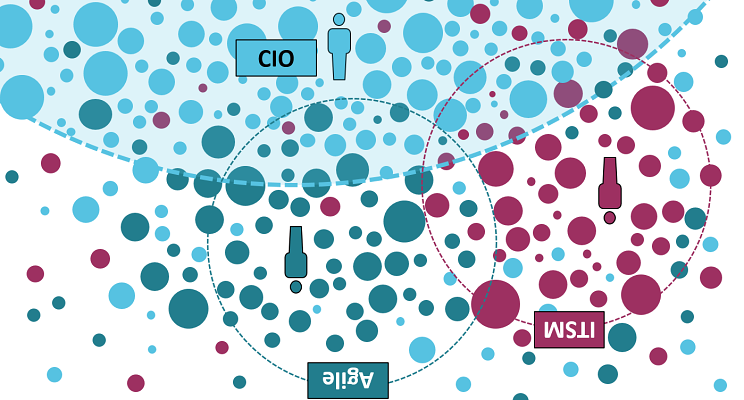 For many proponents of ITSM and agile (DevOps), CIO’s world does not exist, or they see it only as a tiny part of their worlds. But this world is far the most important. This is the world of internal IT managers who are responsible for entire IT departments, in any imaginable type of organization – start-ups, SMB, corporates, enormously large companies with thousands of people working in IT, banks, telecoms, utilities, pharma, healthcare, government agencies, education, military etc. This is the world of the CIO who is challenged with unknowns, no decisions, no right way forward, ever searching for the least worst solution, fighting with major incidents, regulations, security risks, data breaches, data consistency problems, responsible for petabytes of any possible data, fighting to preserve past investments, while it looks irrational from the perspective of inexperienced manager, who never needed to solve the complexity coming from anything legacy or never worked in organization, where rationality of one is irrational for someone else, where strategies might be hidden, not to be shared across organization. What digital transformation for this specific organization looks like? Does more agility generate better and more innovative, truly disruptive ideas? Who should lead digital transformation? IT or someone else? Who else? Should we push on cost efficiency or prioritize innovations, or both all together? Which IT management model is the best for us? ITSM or agile or mix of both or even something more modern, born for digital era? How should we encourage cross departments collaboration and disruptive innovations, rather than incremental improvements of what we have? How to manage periods of silence and periods of radical changes? How to cope with seemingly irrational decisions which happen all the time, while we know that there might be some hidden parts behind of CIO information horizon. Many CIO’s opt for daily management of something called common sense. They adopted parts of ITSM logic and parts of agile to solve some parts of their problems. As an illustrative figure of some organizations we may indicatively claim 20% ITSM and 10% of agile. But there is still 70% remaining. Is agile answer for any CIO problem? Or ITSM? That CIO “common sense” is about making decisions at every possible moment, based on what happened yesterday, what challenge is coming today and what is the objective for tomorrow. It is balancing available resources (skills, money) to maximize benefits for the whole organization (not IT), or to minimize damage when an outage or something really bad happens. The world of the CIO is a combination of adaptive and strategic management, where we also may use parts of agile practices or ITSM approaches for specific areas. Ability to constantly evaluate where resources should be allocated based on actual conditions and unknown future and expected benefits. These challenges require building from scratch a new management model, where the driving forces are collaboration (not profit of service provider), releasing resources for innovative effort, support for AI assisted decision making, support for intelligent agents, support for new emerging business models, where traditional profit calculations don’t work. And this will come soon, based on actual knowledge. Follow @Q4IT for the next part of this exploration to be posted soon.